Through a combination of the latest technology, and the kindness and generosity of strangers, and a happy accident which could only have been divinely inspired, I got my phone back today. I have an iPhone 7 Plus, which has an app called Find my Phone. (This app is not particular to the iPhone 7 Plus, it’s part of Apple’s OS.) When I discovered that my phone was nowhere to be found, I went onto Find my Phone to see if I could locate it. Find my Phone said it was offline – and so I had no idea where it was. But Find my Phone also has a couple of other nifty functions. You can create a message on the locked screen of the phone, with a phone number to call should the phone be found. So I put in a message, in Italian with the help of Google Translate, which basically asked anyone finding the phone to call Jennifer’s number – and I would pay a reward. I lost my phone last week while we were in central Piedmont having a couple of days breather before the hurly burly of Cannes. We had stopped for an afternoon coffee at a tiny place called Lequio Berria, and I think I left the phone on the roof of my car as I went to take some photos of some interesting locals. We drove then to our hotel – a magnificent restaurant/B&B called Da Fabiana, outside of a village called Bossolasco. It was when we were checking in that I realised I didn’t have my phone. We immediately drove back to Lequio Berria and searched everywhere, but couldn’t find the phone. Then I went back to Da Fabiana and did the Find my Phone thing. The next morning we again went back to Lequio Berria, and searched even more thoroughly along the roads that I took leaving the village – calling my phone with Jennifer’s phone, hoping to hear it ring – but without luck. Later that morning Katia, who was so so helpful during all this time (she helps run Da Fabiana with her family) – helped me fill out a Police Report, then accompanied me down to the police station and lodged it for me. I subsequently notified my insurance company that there would soon be a claim for the lost / stolen phone, and that was that. As far as I was concerned, the phone was gone. Jennifer kept saying though that no, the phone wasn’t gone. I would get it back. We had to drive the next morning to Cannes – some three hundred kms away – and for me, once we got to Cannes, the phone was absolutely gone. Then last night, about 9pm, Jennifer got a call on the phone from a lady who’d found it. You see, as part of this Find my Phone app – not only can you leave a message and a phone number, but on the locked screen it also has a CALL ME button. I had asked my telco operator, Optus, to bar any outgoing calls, but evidently this app overrides that. The woman who’d found my phone was calling from my phone to Jennifer! 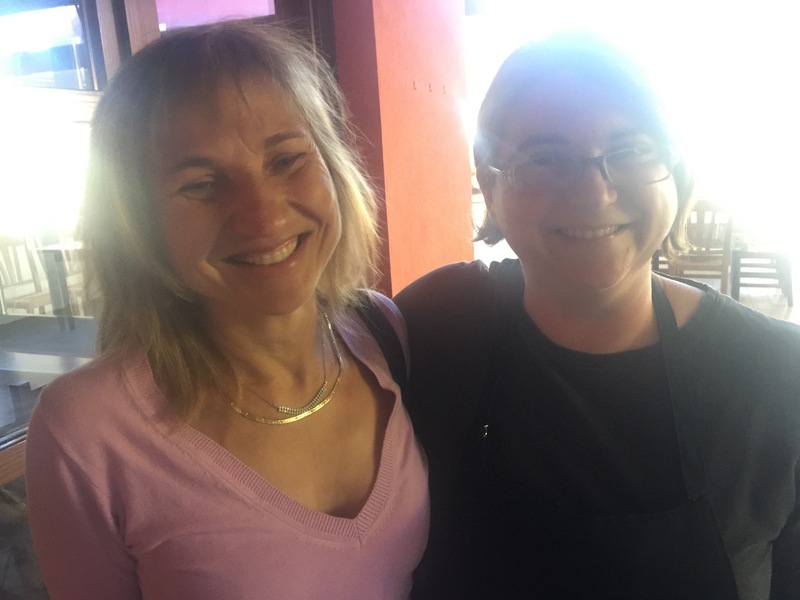 She barely spoke English – but we asked if she could take it to Katia at Da Fabiana. Immediately, with me hanging on the phone, this woman called Katia and they talked – I then called Katia afterwards and she said that she would go around and collect the phone and post it back to me in Australia. I insisted on reimbursing her the cost of the postage, and giving the lady who found the phone a reward, but neither would take any money. This morning I woke at 4am, after 5hrs sleep. I grabbed my iPad, and on Google maps estimated that from Valbonne, where I’m staying in the hills behind Cannes, to Bossolasco was about 280kms – and would take just under 3hrs. Bloody hell, I thought, if I left pretty much straight away I could have the phone by 8am, and be back by midday in time for my afternoon meetings in Cannes. Yes it’s nearly 600kms round trip, about 100kms of which would be on very winding hilly tracks leading up into the mountains, but at least I would have my phone. So that’s what I did. I left the hotel in Valbonne at 4:30am, drove for 3 hrs to Da Fabiana, met up with Katia who was just setting up breakfast for her guests. She immediately made me a cappuccino and gave me a freshly made Italian breakfast cake, then called the woman who found my phone. Remember, it’s now about 8am Sunday morning. She got out of bed, got dressed, and drove the phone over to me. Her name was Previotto, and through very broken English she explained that she had found the phone about 10kms away from Lequio Berria – in a different direction to Da Fabiana, on a road we had not driven on. She found the phone by the side of the road while she was walking – she just happened to see it. Katia thinks that someone picked the phone up from the road when it fell off the roof of the car – tried to unlock it (the iPhone 7 has a six number passcode) – and when they couldn’t they just ditched it. That’s when the amazing Apple Find my Phone software kicked in – combined with the generosity of spirit of Previotto, along with the delightful Katia who could not have been more helpful or caring. Here is a photo of the two beautiful ladies – Previotto on the right, Katia on the left. Let me give a plug to the Da Fabiana. It is one of those rare gems in the Italian countryside where the food is simply out of this world – most of their produce comes from the farm which is a part of the hotel complex – the rooms are beautiful with amazing views of the countryside – and the service and the people who run the place – well, they are wonderful wonderful people. For me, losing the phone was upsetting. I have my life in that phone. Yes I could always get a new phone, and yes I had everything backed up – but I’m here working, and next I go to Madrid for work, and I need to be contactable. But thanks to Previotta, and Katia, they turned this upsetting incident into highlight of my trip with their acts of kindness that I will remember always. This entry was posted in Post Camino and tagged Bossolasco, Da Fabiana, Find my Phone, lost phone by Bill Bennett. Bookmark the permalink. Haha -you’re right Laurie! And yes, Da Fabiana is fabianulous! I have Angie. How do you think I went?? Here’s the secret (which you obviously already know, but it bears repeating): I have absolutely no emotional attachment to whatever has been lost. I don’t care if I find it or not. I’m just pitching in to help relieve someone’s anxiety. Once you let that go, whatever is lost is either found or not really needed in the first place. You had at least three members of the Finder’s Club working to find your phone and return it to you. So I guess you really needed it. P.S. Looking forward to seeing you in SoCal soon. Dear Michael – that’s a great idea, a Finders Club! And yes, detaching from the outcome is so terribly important in any of this metaphysical stuff. It’s something that’s discussed in my film in fact. A great anecdote Michael, thank you – and yes, it certainly bears repeating, because while ever you’re stressed and anxious, you can never lift your vibrations high enough to actually find it, or have it come back to you. Synchronicity at work once again Bill….my admiration for your long drive back to recover the ‘lost but now found again’ phone…..the results of such action will be remembered and talked about for many a year is my guess. Glad that all has come to a good end. Indeed Susan. The more I learn, the more I realise there are no accidents, there’s no loss, and there’s no such thing as luck! Only opportunities to learn and grow. Hey Lesley, yes I’ve been watching the temps in Mudgee. It’s getting chilly! Madrid is hot but we’re returning home today but then we’re only back a week before we go back to the States for PGS. This year was always going to be busy! Hopefully we’ll see you while we’re back. Oh, and yes, when you next go to Italy, I highly recommend Da Fabiana. If you do go there, give Katia a big hug for me!